Cook the pasta in salted water until al dente. Rinse in cool water. Drain. Heat oven to 400°F. Melt butter in a large ovenproof skillet over medium-low heat and swirl to coat sides of pan. 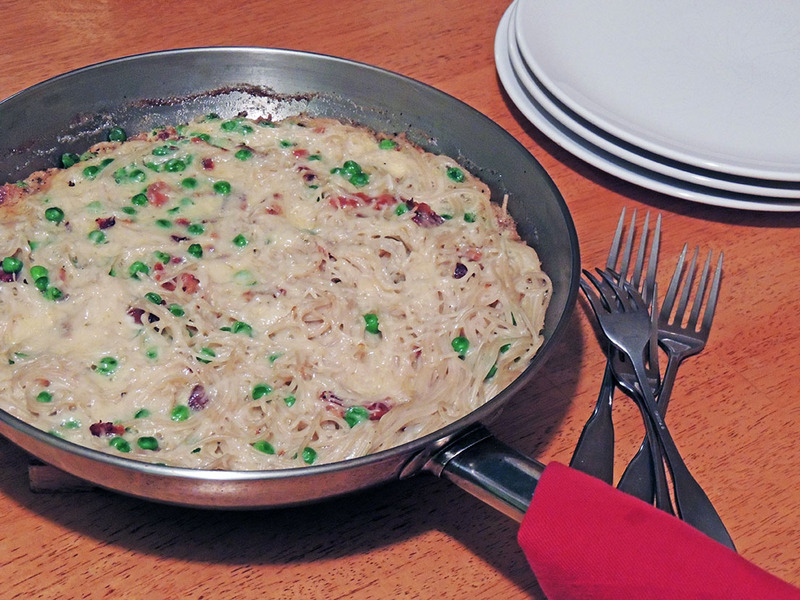 Beat eggs with salt and pepper in a large bowl, then stir in the pasta, bacon, peas, and Parmesan. Stir to evenly distribute the peas and bacon. Pour the egg mixture into the skillet. Cook, undisturbed, about 5 minutes, then transfer to oven. Bake until the top is just cooked, about 7-10 minutes. Remove and serve hot or at room temperature.